Smudge has his bandana, now I need to read the book. Would be nice to win a copy. All of these sound so good. How do you choose one to read? Love Cozy Mystery. Thanks for the giveaway. Awesome December releases. Now I just need a snow day so I can get some reading done. There is nothing better than relaxing under a warm blanket with a cup of tea and a cozy mystery. What a great contest! I love nothing better than a cozy mystery so am happy to enter! Thanks so much for the opportunity. Thanks for bringing back this wonderful holiday tradition. I was lucky enough to win a book last year-let's see if I can do it again! Happy Holidays! I have read Krista Davis's other series. I haven't started this one yet. I am always interested in new books. Please enter me into the daily drawing. I am enjoying getting to know the authors from this site. Thank you. Thanks for all you do to promote my favorite authors! I'm looking forward to reading this on a cold December night! Can't wait for the new Krista Davis book! This looks great! Thanks for the opportunity to win. Sounds like I need to get my Christmas wrapping done so I can settle in with a good book! I'm ordering Murder She Barked today! Thanks for the chance to win more! December is the perfect month for cozy mysteries! Well, that's every month, but the ones in which I hibernate make reading the most fun! Thank you for this opportunity. What a great idea! That shouldn't come as a surprise, though, since it's from a bunch of great people! Thanks for the giveaway!! Would love to win one! Thank you for doing this giveaway, Merry Christmas to you! Hope I win!!!! What a great Christmas Give Away idea! Can't wait for all the new books!!! This book looks awesome! Would love to win! Looking forward to reading these new releases! Happy December. Thanks for this great giveaway. I am always up for reading new books and stories! What a "killer" idea to make a contest out of it! I hope I win! Thanks for the opportunity! I sincerely hope I am chosen. Thanks for the opportunity! Wow what a nice giveaway, I love this series. Would love a good mystery! I bought a lot of cozies at the beginning of November, but there is always room for more! My dog too won a bandana. Thank you! Maybe now the book??? This will be a very fun month! Hoping to win! Would love to win! Always looking for something new to read!! Thanks for the chance to win one of your books. I like reading new authors. Great giveaway! Love to find new authors! My first visit and what a great contest!! Would love to win! Love mysteries! what a wonderful way to kick off December!!! MURDER, SHE BARKED and THE SAYERS SWINDLE were already on my TBR list ... the other books have now joined them! 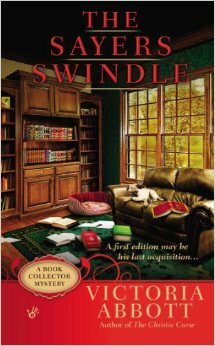 (I really dug the Domestic Diva series and the first Book Collector Mystery title.) Happy holidays, y'all! Murder She Barked is on my to be read list as well. Love reading the Domestic Diva Series, so happy that there is a new release before next June again. Have a great Christmas! Lots of other authors on here I enjoy as well. I would love to win a copy of Murder, She Barked! I enjoy books by Krista Davis. I love cozy mysteries. I have never read this author but this book sounds good. I would love to win this! Krista Davis is a fabulously talented writer, and I am proud to call her one of my favorites! "Murder, She Barked" sounds like just the book I need to read while curled up on the sofa with my Scottie. Today's mystery, "Murder, She Barked", sounds like a good one to read while petting and cuddling my beagles. I have been reading Killer Characters for some time -- and have found some fabulous reads. Thank you. This one, Murder, She Barked, isn't one I have read yet, but would like to. 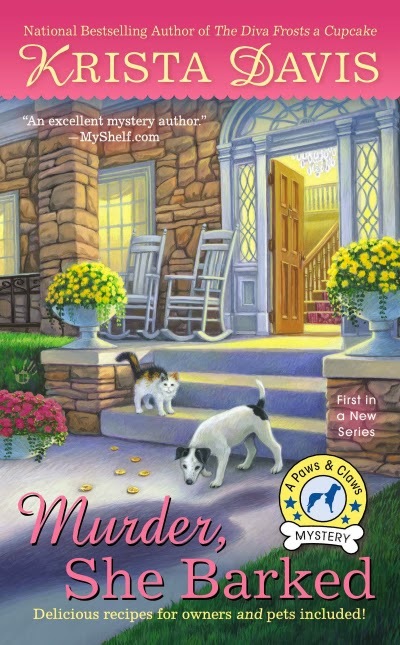 I can't wait to read Murder, She Barked. Cozy mysteries are my favorite way to cope with the long winter months. A hot cup of coffee and a warm blanket complete the scenario. I received my confirmation today that my pre-ordered copy is in the mail! I have really enjoyed seeing all of the doggies in their bandanna's on FB. I know this series is going to be great. Keep up the awesome job! Love to win and give my review on my 2 online bookgroups, that I just featured Krista Davis on. Great contest. Thanks for thinking of us! What a great contest...hoping for Christmas magic to happen! Love good books for cold December days. Great contest, thanks for doing this. I've come to the realization that I will not live long enough to read all the books that I want to. But I'm sure as heck gonna try. Lots of great reads already on my wish list! Buttoned Up is on its way from Amazon - can't wait! I can't wait until all this moving business is done so I can get back to reading! I am missing books so much! Thank for such a wonderful contest! I am keeping my fingers & toes crossed. Krista, I love the Diva series, so I am sure this will also be a great read. Here in Kansas City, the weather is getting colder; it's the perfect weather for curling up with a good book! Love krista Davis! Thanks for the great December giveaway chances! So many great books coming out this month! I love books, which means this is the perfect contest! Good luck to everyone! There is nothing that makes me smile more than sitting down to one of your cozy mysteries! Thanks so much for the great giveaway! So many wonderful books coming out this month. Cannot wait to get them on Tuesday. Murder, She Barked looks really good. I love it when new series come out. More for me to read! Thank you for a chance to win. Being a mystery lover, there are just so many great cozies and other mystery and adventure/thrillers out now that it makes it hard to get to read everything that I want to read. I try to keep up with each of my favorite author's series but have gotten a bit behind lately with so many family commitments so sure would love to win Murder, She Barked which I am sure will be fantastic. Thank you. Cynthia B. Woo Hoo! this site works. thanks, MJM! Can't wait to read all your books. Fingers crossed. I hope, I hope I hope? HI - Looking forward to reading more wonderful mysteries! Love Krista Davis cozy mysteries! Would love an earlier Christmas present of Murder She Barked. Whatcha think Santa Krista? 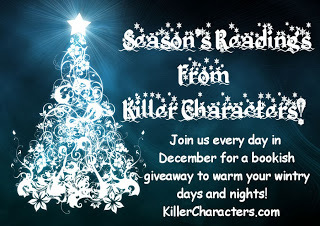 Happy Holidays to all @ Killer Characters! Alot of great authors to read! I'm so interested in your books. If I don't win one, or get one for Xmas, I'm ordering! Thanks for the chance!